Have you ever given up something by accident? I ask because when we set a date for getting married, fired up with joys of planning and list-writing, I included a note of everything I was going to give up to save money for the aforementioned nuptials. They included (it was pretty ambitious, given my penchant for the frivolous): diet coke, women’s magazines, beauty treatments in salons, taxi journeys, new make-up or skincare before existing stuff ran out, clothes, shoes etc. Needless to say, several weeks after the list was drawn up diet coke, new make-up, beauty treatments et al were still making their way into my shopping basket. The incentive just didn’t seem to be there. However, about a month ago I discovered a new author I really like; a woman who has written a series of epic stories scanning continents and including fabulous characters, themes and wit. For a month or so I haven’t looked at women’s magazines and, when this registered consciously, it became a point of pride not to buy them any more. (The odd free edition of Stylist or buying Good Food magazine does not count). So, thanks Diana Gabaldon – you may have inadvertently contributed to my wedding funds! As I am a marketeer’s dream, being without women’s magazines has also affected my make-up and skincare buying habits. Without the constant bombardment of new product advertising and promotions through beauty pages, I’m no longer tempted by the latest snake oil trick promising all kinds of wrinkle reduction, complexion brightening and skin plumping. In addition, reading novels tends not to leave you feeling as inadequate as magazines do (‘why oh why don’t I have that great job, those gorgeous clothes, that particular new form of exercise guaranteed to tone me up in half an hour’). And, er, why do I care so much for these things?! 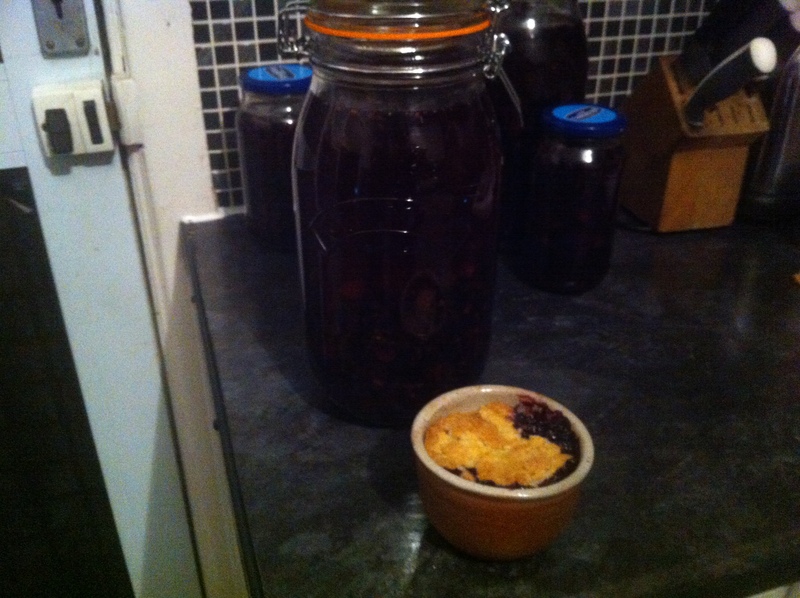 Bramble vodka and crumble – could we get more mellow fruitfulness…? Favours update: this week we went brambling (see the pictures above). For those of you outside Scotland, this means gathering up free fruit courtesy of your nearby hedgerows, and specifically refers to blackberries. We’ve collected roughly 1.8kg in total, which have been mixed with 700g sugar and four bottles (4x75cl) of vodka – cheap and cheerful, no point wasting Grey Goose on this. I’ve sealed it up in Kilner jars and it’s now a waiting game; the end result (hopefully) a pretty potent fruit liquer to be divided up among small bottles and labelled for the wedding.